The Phoenix Award was designed my the Atlanta Mayor’s Office for organizations and individuals who have made significant contributions to the residents of Georgia. Mistress of Ceremonies, Ms. Amanda Davis, Fox 5 Channel news anchor, officiated the lively, upbeat and well orchestrated ceremony in the Envoy Room at the Buckhead Ritz Carlton Hotel, Saturday, July 15, 2006. Dr. Jay Tribby, representing Mayor Shirley Franklin’s office, presented the Phoenix Award from the city of Atlanta to Mrs. Bryan. He told the guests that it was rarely given to individuals, could not be requested but had to be earned when others believed in your work. 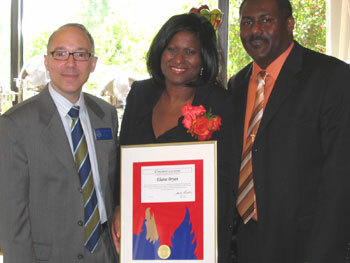 He further stated that the Phoenix Award was designed specifically for people in the caleber of Elaine Bryan. He said it’s not “an easy award to get” as great emphasis is placed on who is granted the award. However he added that the City of Atlanta had no difficulty in presenting the award to one so deserving for changing lives and providing direction to young people in the State of Georgia. Paying glowing tribute to Ms. Bryan was the principal who hired Elaine, Diane Clark of Chamblee High School for high achievers. “I felt obligated to get the best counselor, friendly, uplifting, highly organized, efficient and someone who loves children,” she said. More importantly, she referred to Mrs. Bryan as “a wonderful friend” whose counsel was always sought after and greatly appreciated. Amanda Davis, Fox 5 Television’s anchorwoman, told guests that as a counselor, Mrs. Bryan remained true to herself and displayed genuine love for over 400 children under her supervision annually. ” She loves to be with children and see them excel. I know the value of a good school counselor,” she said. Special tribute came from Mrs. Bryan’s husband, Greg, whose piano rendition of John Legend’s Ordinary People received loud applause. Some guess in the oudience were: Ms. Karen McEnerny, Council Member, District 6, City of Sandy Springs, Air Jamaica’s representative, Ms. Michelle Henry, Clayton County District Attorney , Jewel Scott, Dr. & Mrs. Edward Layne (Hon. Consul of Barbados), Mr. & Mrs. Alberga,president of the Atlanta Jamaica’s Association, Mr. & Mrs. Vin Martin, Alrene Barr, Teletta Holt, Norma Rushing, principal, Derry Williams, Yasmin Cambell, Sean Grant, Carl & Sandra Grant ( Elaine’s relatives), Mr & Mrs. Harris, Dr. Donovan & Jacqueline Christie of Anwan Medical Center, Doobie & Vickie Shemer, Director of Amdocs, students:DiAngelo Williams, Jerome Taylor & Monique Smith, Angella Richmond (TBS), Dr > Pottinger & Rosemary Glean (DeKalb Board of Education).